National Transportation Data Challenge Kicks Off on May 2-3! 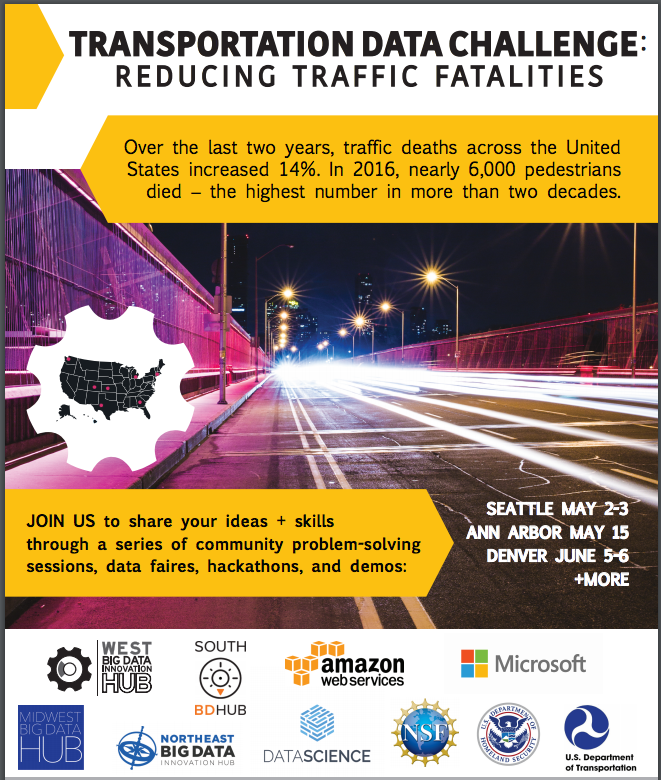 The Big Data Regional Innovations Hubs have announced the Transportation Data Challenge, a series of community problem solving-sessions, data faires, hackathons, and demonstrations, held in collaboration with the U.S Department of Transportation, Amazon Web Services, Microsoft, Data Science Inc., and others. We encourage community members to join the conversation about reducing traffic fatalities with #VisionZero and the #DataChallenge by using #BDHubs. For more information, please visit the landing page , where you can sign up to get updates, and save the date [May 2-3, 2017] for the Launch Event next month in Seattle.